School is a little bit more labor-intensive for Shan Beebe and Tyler Perry than for most students, and they wouldn’t have it any other way. While many of their peers are sitting in a classroom dissecting Shakespeare or calculating derivatives or integrals, the seniors at Whitehall High School are busy patching blacktop and servicing backhoes. Their classroom isn’t contained within four walls. Instead it extends to the yard of the Whitehall Town Highway garage and the roadways throughout the community. For three days every week, from September to December and April to June, Beebe and Perry receive practical, hands-on training at the Highway Department. They pave and improve roads, dig ditches, install fence posts, service trucks, and serve as flagmen directing traffic. “We operate equipment, pave roads … we do whatever we have to do,” said Beebe. Beebe and Perry are both enrolled in a heavy equipment maintenance and operation course at BOCES in Hudson Falls. The two-year program, based on the National Center for Construction Education and Research Contren Learning Series for Heavy Equipment and Repair, introduces students to the trade. 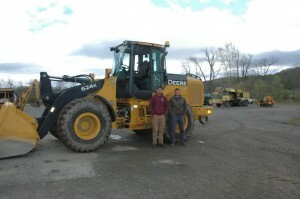 After a couple of hours of instruction in core subjects, like math, English and science at Whitehall, the pair spends Monday and Tuesday afternoons at the BOCES facility learning how to operate, maintain, diagnose and repair a variety of heavy equipment such as backhoes, bulldozers, bucket loaders, excavators, dump trucks, and skid steers. “We learn a lot of equipment maintenance at BOCES,” Perry said. Last year, students enrolled in the course completed work on a baseball field and this year they have done some work in Cole’s Woods in Glens Falls. Although it’s not a requirement of the course, students are encouraged to seek an internship where they refine their skills and gain more experience. So every Wednesday, Thursday and Friday, Beebe and Perry work with the crew at the town highway garage. Pratt has taken two students at a time for a few years and said the program has been excellent. He said Beebe and Perry have freed up guys to get other work done and have saved the department and, by extension, the town money. As an example he discussed how Beebe was out working with the crews on some of the town’s roads and Perry was left behind to remove a ramp at the highway garage. By the time they got back, the entire ramp had been torn out. Beside the fundamental skills of operating and maintaining equipment, Beebe and Perry learn the various nuances, and tricks of the trade that can’t be replicated in the controlled environment of BOCES. They also learn how to work with people and handle the different personalities they’ll encounter on a work site in the future. “I’ve picked up a lot being here,” he said.